The App Store is a very hit-driven environment. A few apps sell a large amount of units, and the great majority sell next to nothing. That’s somewhat similar to the music industry, except that the audience for music is much larger, so both the big hits and the small players get more sales. We’ve drooled over the numbers chart toppers sold, we’ve seen sales reports of very successful games, and we’ve also seen what happens when apps languish at the bottom. I want to share the sales data for Flower Garden. Not just the raw data, but a bit of the story behind it, my thoughts, struggles, and why things happened the way they did. The first thing that you’ll notice is that Flower Garden is a strange in-between app. It’s far from being very successful or being at the top of any chart, but at the same time it probably made more money than 99% of the apps on the App Store. It was also reelased on April 10th, so this represents 10 months of data, an age after which most apps are usually on drip support. So this should be an interesting new data point. I know that if I put it off, you’re just going to skip to the end to see the sales plot, so let’s get that out of the way. Here it is. The vertical axis is daily profit in US $ (after Apple’s 30% cut). Flower Garden generated a bit over $21,500 over a period of 10 months. I would hardly consider that an entry-level salary, much less in California, but it’s enough for someone without a family or mortgage to (barely) make a living. I supplemented that with some teaching, writing, contracting and consulting, so overall I managed do fine and even save a bit of money last year, all while being totally indie and having full creative control over what I did every day. I’m not getting rich, but it’s not a bad life, really. How many hours of work does Flower Garden represent? It’s really hard to say. It was 6 solid months of work from conception to release, but then there was the fuzzy time spent on marketing, updates, support, new features, etc. I would estimate it was a total of 8 months of full time work, which, at 50 hours per week, makes it 1600 hours. So that’s a depressing $13.44/hour. At least it’s over minimum wage! 🙂 On the positive side, Flower Garden should continue to sell in the foreseeable future, so that amount will go up a bit over time. There’s clearly a story behind that graph. It’s not the usual exponential drop off you expect from most (unsuccessful apps) and shows how an aging app can pick up steam on its own after many months on the store, without ever being featured by Apple. Let’s start from the beginning. Release day! After six hard months of work, I submitted Flower Garden to Apple sometime at the beginning of April, and on April 10th I was surprised to see it had been approved. It caught me a bit off guard without my marketing campaign in place, but I announced it high and wide on this blog, Twitter, Facebook, and I even spammed all my friends with an email. The results are the area marked as (A): About $50-$60 in revenue per day (so about 25-30 sales). Not bad considering that was mostly my friends taking pity on me and people randomly seeing it on the new releases list, but it was far from an auspicious start. I also contacted all the media sites I knew with a press release and promo codes to entice them to write a review. I was lucky that many reviews appeared over the next couple of weeks, but unfortunately they were all spread out, minimizing the PR effect. 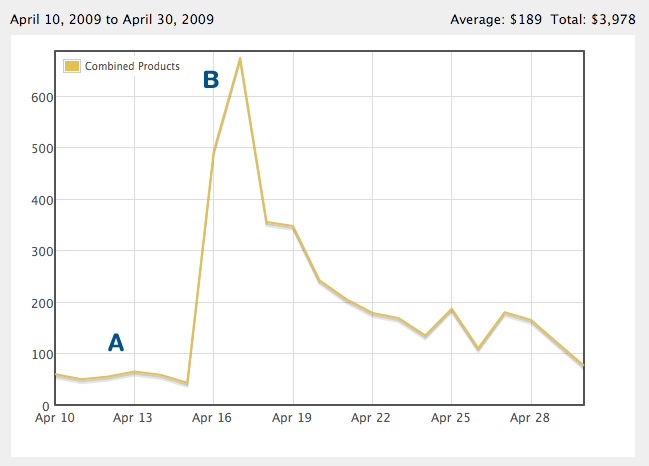 The biggest effect was when Flower Garden was simultaneously covered on TouchArcade and MacRumors. That’s what caused the big sales spike (B). From there, it was a standard exponential drop off, until, on the last day of the month, just three weeks after launch, revenue dropped below $100/day again. If that was all there was to it, Flower Garden was a big flop and I should start dusting off my resume. I wasn’t ready to throw in the towel yet. I had a couple cards up my sleeve that I was hoping would change things around. After all, May 5th is Mother’s Day in the US. What better time to do some promotion and get Flower Garden noticed? I decided to run a contest and give away $100 in real flowers to the winner at the same time I put Flower Garden on sale for $1.99 for the week of Mother’s Day. The result? The revenue dip you see in (A). Mother’s day is probably the small, second spike in that period, but overall, that week was a loss. Lesson learned: Don’t make a sale unless your app is in a visible position (on a top chart somewhere). Flower Garden was nowhere to be seen, so the sale had no effect other than to cut profits by 33%. I released a couple updates and did the trick updating the release date to get on the new releases list (which no longer works) and I got a couple minor spikes with (B) and (C). Subsequent updates later that summer had almost no effect anymore on sales. The trend was worryingly clear as profits dipped as low as $10/day in mid June (I have no idea what happened that day, but it was the lowest day ever for Flower Garden). In early June we launched App Treasures. App Treasures is a label for indie iPhone game developers with top-quality games, and one of the main tools we’re leveraging is some cross-promotion for our games, both through the web site, and from an in-game view liking to each other’s games. Initially there was no measurable effect, but then Harbor Master was released and shot all the way to the #2 position on the US store and held its position on the top 50 for a while. The results is the area under (D). It definitely brought in some sales to Flower Garden and reversed the downward trend. 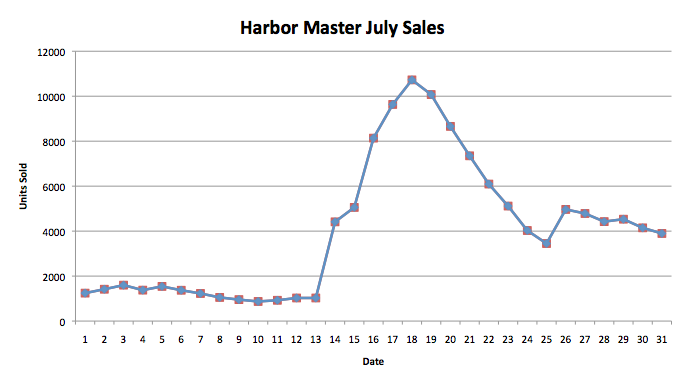 Unfortunately all good things come to an end, and referrals from Harbor Master dropped off and its slipped down the charts, and Flower Garden sales continued sinking. At this point I had to face reality. Was it time to give up on Flower Garden and move on to another project? I was ready to do that, but every day I would get several emails from users saying how much they loved Flower Garden, how much happiness it was bringing to their lives, etc. Some of the stories were really touching. At the same time, every time I would show the game to someone, they usually really liked it. Not liked-it-because-I’m-there, but really, genuinely liked it. Why weren’t more people buying it then? Two problems: First, screenshots were not conveying how cool growing, animated flowers you could touch were, and second, most people didn’t even know Flower Garden existed. It had never been featured by Apple on the App Store, and the audience I was trying to reach didn’t read TouchArcade or other iPhone review sites. It was at this point that I decided to give it one more try. My goal wasn’t adding more features as I had done with the updates so far, but to make Flower Garden more visible. I wanted more people to know that Flower Garden existed. The first thing I did was to add Facebook integration. Not only could you send bouquets through email, but you were able to send them directly to your Facebook friends. The advantage of that approach from my point of view is that all your friends also saw the flowers so for every bouquet sent on Facebook, hopefully dozens or hundreds of people were being exposed to Flower Garden. The result on sales: Not much. Maybe it made the early part of July a little higher than it would have been otherwise, but no noticeable difference. The second approach was to release a lite version of Flower Garden in early September. I was confident that Flower Garden was a good app, and I was hoping that once people had a chance to try the lite version, they would purchase the full version. Fortunately I was right and the effect on sales was very noticeable, pretty much doubling sales (E), but it never really took off in any significant way, and sales slowly declined over time. You’d think that I would give up at this point, wouldn’t you? And I don’t say that with pride. I mean, it probably would have been smarter to quit a long time ago. But somehow, every time I was ready to move on , something else would come up that would entice me to try something else with Flower Garden. To be totally honest, I wasn’t expecting very much. Even including all the units of the Lite version out there, there just weren’t that many units. Especially not that many people using it on a daily basis (I’m sure a lot of the free ones were downloaded and quickly forgotten). But I thought it would be a good experience and if I only spent a week on it and made $1,000 I could call it even. The result was totally unexpected. The Flower Shop opened on December 6th and revenue immediately shot up (A). On December 21st I released a new IAP called Seeds of Winter with 8 new winter-themed flowers, and people loved it and immediately purchased it. Christmas day came and went with somewhat of an increase in sales (C) but nothing really spectacular. 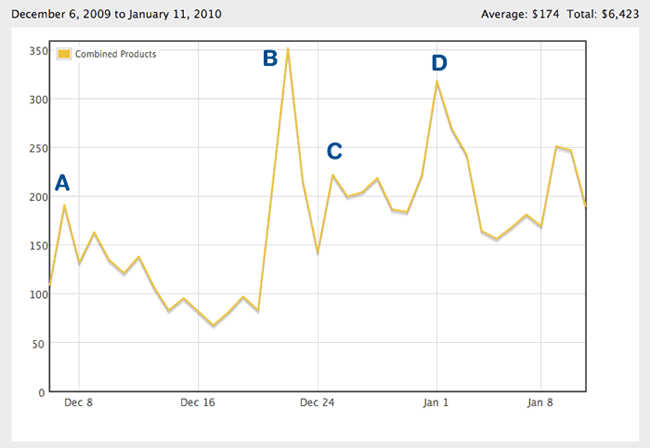 Finally, to wrap up the year, there was a big spike on New Year’s Eve (D) (do people send flowers on New Year’s Eve? Really?). Afterwards revenue flattened out, but at a much higher amount than before. Before IAP, daily revenue was about $50/day. Now it’s more around $180/day. That’s totally beyond any of my expectations! It looks like sales for Flower Garden (blue) continue to be more or less the same, with a slight increase after Christmas. The IAP from the full version of Flower Garden (green) account for most of the extra revenue, especially at the beginning. But it’s very interesting that the purchases coming from Flower Garden Free (orange) are steadily increasing and, as of last week, they became almost as large as the ones from the full version. That can be explained because more and more people are getting the free version and upgrading it instead of buying the full version (which is exactly what I was hoping for). What’s also really interesting is the downloads of Flower Garden Free. Flower Garden Free was never a big player. 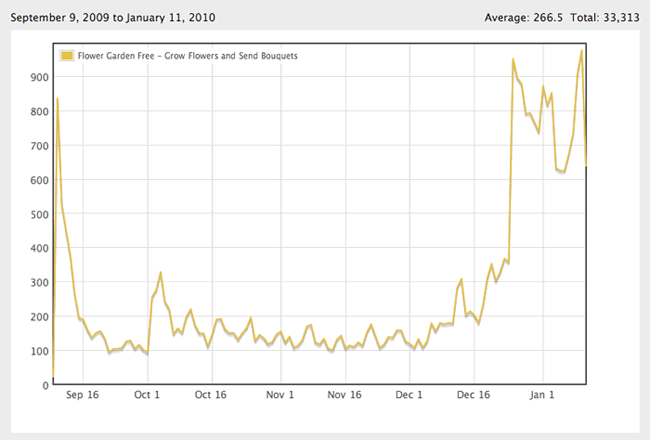 It had the usual big initial spike, but then it settled down at around 100-200 downloads per day (which is very few considering there were 50-60 purchases per day of Flower Garden Full during that period). But, as soon as the in-app Flower Shop was released, downloads started climbing, and on Christmas day they went through the roof (relatively speaking). So it’s no surprise that IAP from Flower Garden Free picked up in these last few weeks. I have no idea what the future will hold for Flower Garden. This week Apple selected Flower Garden and featured it on the App Store as a Staff Favorite worldwide (that period is not show in the sales graphs). I’m also already preparing a new update and some more IAP for Valentine’s Day, so I’m sure there will be more ups and downs in the near future. I’d certainly like to continue supporting Flower Garden for as long as it’s profitable. I’ll follow up this post in a couple of months with the aftermath of the App Store feature and Valentine’s Day. Also, stay tuned for another post with more details of the IAP, what’s successful, purchase patterns, and more. Great data, especially the IAP stuff, thanks for sharing! Thanks for sharing Noel, it’s so hard to get my expectations set correctly — this and other articles like it helps. I try to always keep very high hopes, but very reasonable expectations (one of the cognitive dissonance things I guess). I was really hoping to see many more sales for a quality game like yours. But I see a bright future for Flower Garden + IAP. Excellent data Noel, really appreciated. Thank you. 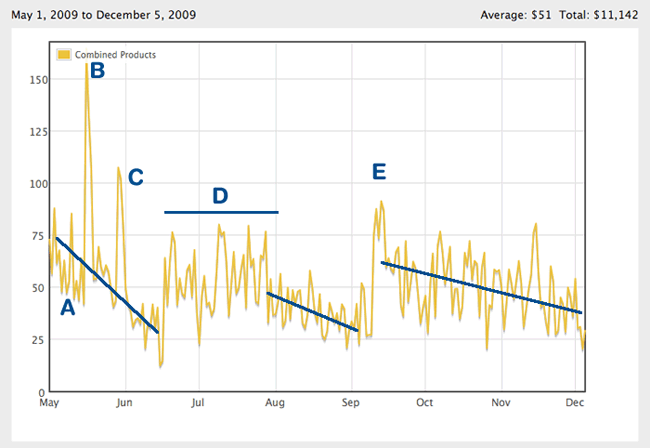 Thanks Noel, great to see that data, and it looks like the future is bright for you with IAP! Thanks Noel, you’ve certainly given me something to think about. Do you think that as your user base increases, IAP will make up continue to make up a bigger and bigger proportion of your profits? Do you think that adding more items in the store will help with that? Thanks for sharing, Noel. This is highly interesting (as about anything you write)! Let me quickly share some numbers for the free “51 Japanese Characters” http://itunes.apple.com/de/app/51-japanese-characters/id348610113?mt=8 app i programmed, released Dec 30th 2009. With no marketing efforts at all the app was downloaded 1432 times in 17 days. Due to the nature of the title, 25% of downloads were from South Korea and 9% from Japan. USA still leads the pack with 32%. I also interviewed other iPhone game developers over the last weeks. The monthly average income they reported averaged in one case at about €1.200 ($1,800) per month for a well done $.99 Flight Control style game with visual style on par with its competitor. It was available for 6 months. Another developer reported a total income of €500 ($800) spread across 4 games or so with each new game doing about double as the previous one. A period of 10 months if i remember correctly. So this guy is slowly getting somewhere. As for marketing he’s blogging regularly, i’m not aware of any other activities. A third developer made a $.99 cent puzzle game, nicely done but amateurish graphics which probably hindered sales. Also no marketing at all, the website is rudimentary and contains no relevant content. Still he made €200 ($280) per month. I’ll keep the developer’s identity and app names anonymous as i did not ask them for permission but i though sharing those numbers here will put Noel’s earnings in better perspective. I think he’s doing better than most (as he said). Thanks everybody! It’s funny how this comes as good news to some developers, and as bad news to others. It depends on expectations I suppose. George, in the case of Flower Garden, I’m convinced that most profits will eventually come from IAP because of Flower Garden Free (that’s the version I’m pushing most these days). I’m definitely planning on adding more items to the store, so hopefully it will continue the trend. Biggest win for me right now would be to get more folks to know about and try out Flower Garden Free though. I’ll follow up this post without another one concentrating on the IAP sales, but it will be interesting to see what percentage of active users bought 1 item, how many bought 2, etc. Hopefully there are some interesting insights there as well. Noel, thank you so much for the wonderful data and information. Your insight is very much appreciated. Best of luck in the new year! Thanks for the real data — much appreciated. This is definitely optimistic for the future of the platform, we might have to consider iPhone games in 2010. Thank you very much, this was interesting reading. After seeing your data and thinking about our latest release… it feels like we did all of those things which didn’t matter much at all in your case (reflecting the same experience). Noel, thank you so much for this post. I’ve really enjoyed following your work over the years. The app development market has always been a bit of a mystery to me and its articles like these that are so instructive and interesting. Thanks for the honesty and the time to put this together! Thanks a lot for sharing your story with us Noel! I was very surprised to see the numbers as I was expecting your app to be doing much better. Let’s hope the IAP sales will make it up 😉 Good luck! 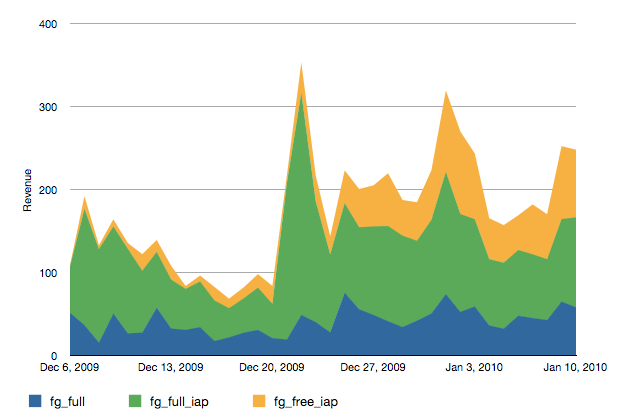 Thanks Noel for sharing, it’s been really helpful especially the data regarding the Free (plus IAP) vs Full. Looking forward to see the results of being featured by Apple. Thnaks Noel for sharing your story with us entrepreneurs. I sure hope FlowerGarden will do better in time to come. Cheers. Thanks for sharing! You’ve given me a lot of insight into the world of mobile apps… I’m a developer as well but have yet to venture into iPhone stuff, although I did recently install the SDK..
Great summary of what you’ve been going through with Flower Garden! This sort of sharing is appreciated by all iPhone developers looking to maximize the potential of their app. I’ve been following your progress on the app since you first mentioned it and it’s interesting to get the big picture view of how things have been going. One of the key things is to keep the app fresh in the minds of the users by frequent updates (whether they be tied to holidays, seasons, or involve new features) and promotions. You’ve clearly been successful in generating a response in that regard and your graphs and how they correlate are a great help. I especially liked how you showed what sort of an impact the IAP had. Congratulations on being featured as a staff pick and I hope it brings in new users! Thanks for sharing Noel, it was good read. Getting featured does wonders to your sales, good job. Fantastic! And congratulations on getting the staff pick – I’ll pick up the app so I can be more intelligent with my questions. I may reach out to you with a couple indie games I work with for App Treasures. I’m curious that in addition to your facebook integration (that seems like if you can build to critical mass and make it relevant to game play could be a huge viral boost) have you evaluated social community extensions like Plus+ http://plusplus.com/games (with its XBLA like community approach that doesn’t seem to overlap with App Treasures approach)? Incentives in the game play to cross pollinate or evangelize your game to new and existing players seems really important. Now with IAP as with Free2Play MMOs (F2P) and all facebook games it all comes down to analytics and creating scarcity and incentivizing viral behavior. Another thought on community is the premium member approach that I’ve seen F2P use to add additional revenue by having an exclusive group that allows players to get things not available to the free population – ie. put stuff in the full paid version that make it worth converting to from free version (even just economy credits), but the real goal being a way to get people to feel more connected to your game and playing more frequently and buying more stuff. Thanks for sharing the data, very appreciated and also a good story to read. The thing I’m wondering is: why did the downloads of the free app go through the roof when you lanched the Seeds of Winter IAP? Next to having IAP I think that is the biggest reason behind your final success. Was it just the case of being there at the right time (Christmas, flowers, winter….) or did you got promoted in an other way? Nice data. Thanks for sharing. Great post, Noel. Love to see how you slogged it out on the app store. I also appreciate you being so up-front with the numbers. Extremely interesting stuff. Man that was a great post. I love it when anyone posts numbers like this. I really hope your app continues to do well. Thanks for sharing! Hi, very interesting read! One thing though: after I read it, I clicked on the link to the Flower Garden website, where I tried to find a link to the iTunes Store. It took me quite a while to find it, being all the way at the bottom, even below the Facebook badge. Maybe other people have the same problem, and making the link to the iTunes store more prominent would make that graph go up even more? Thanks for sharing, very interesting post. We had a similar story than Flower Garden with Sudoku Magic. Sudoku Magic http://bit.ly/SudokuMagic1 is one of the best sudoku app on the app store, with a unique feature to capture any sudoku game in a newspaper just by taking a photo, but got very few sells from july to October, less than 500. In November, the lite version http://bit.ly/SudokuMagicLite1 increase the total downloads from to 10,000. 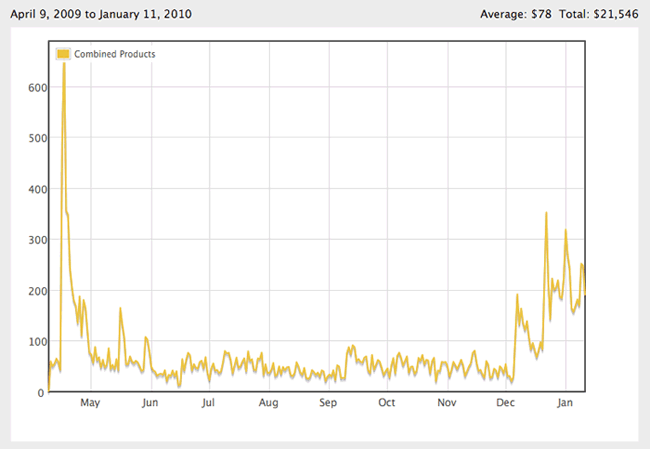 When we were featured in the Advent Calendar in December http://bit.ly/AdventCalendar1 , our downloads jump to 70,000 in just few days. We are still developing new features. right on – this is the reality of indie development in the app store and i’m glad someone finally took the time to present it to the world. apple has painted a rosy picture by propping up specific developers who hit it big, but the truth is it’s a grind, especially if you’re going it alone. it is a great lifestyle, but it’s not the lifestyle of the rich and famous – it’s the lifestyle of a starbucks employee. if you like this article i also strong recommend the “numbers” article by ian over at nimblebit – it paints a less pessimistic, but somewhat more driven view on things.